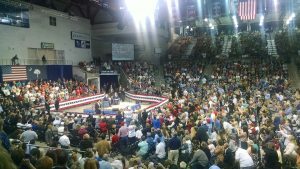 Donald Trump speaks before a packed audience at USC Aiken. On Saturday December 12th area voters had the opportunity to see and hear a major presidential candidate. 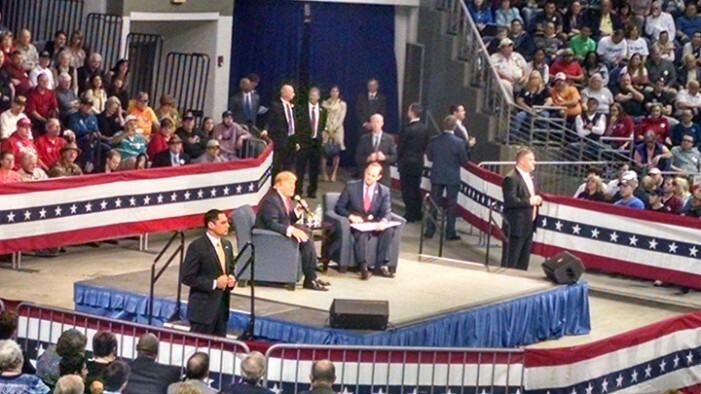 Over 4,000 people packed the USC Aiken Convocation Center to hear first hand some of the positions Mr. Donald Trump has taken on a number of issues. It was an exciting event and was perhaps the largest political rally of its kind in recent memory. Mr. Trump touched on some of his recent controversial positions on stricter border control with Mexico and controlling radical Islamic terrorists. His views on those issues brought forth a handful of protests. The protesters rudely interrupted what was otherwise an informative event. Attendees learned that beyond the hot button issues of immigration and controlling terrorism Trump espoused views on the Federal government and how he felt it was overreaching its authority in areas of education, environment regulation, healthcare and matters concerning labor. Leading Trump through the discussion was Alan Wilson who serves as the Attorney General for South Carolina. Mr. Wilson questioned Trump on one of the leading Constitutional issues that being the repeal of the 2nd Amendment or increased gun control. Trump firmly supports the right of American citizens to bear arms. His words on the subject brought applause from the crowd. Mr. Trump, a billionaire businessman and not being a career politician gives some people hope that he can shake up the status quo in Washington and not be pressured by special interest groups who finance and seek to manipulate the political process.